OMG this book so far... is so goooooood. I can't believe it is free. IT IS FREE, YOU GUYS on Nook and Kindle. Have you ever read a romance novel and felt like it's kind of all the same story, just different character names and settings? Especially historical romance. You know the ones: she's a wallflower, he's a rake. But underneath it all, she's got sass. And underneath it all, he actually has a heart. Only he can truly see how beautiful she is. Only see can see the man he could be. Blah blah blah plot-cakes. I'm not saying I don't like those books. I have read and will continue to read plenty of them. Because tropes work and they keep us coming back for more. But, every once in awhile, you stumble upon a story that's different. 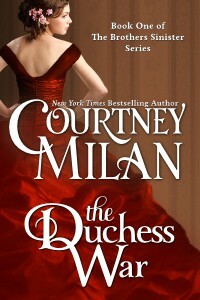 The Duchess War is that story. Without spoiling too much, I will say that our heroine, Minnie, is a wallflower. But there is a very good, unique reason why she tiptoes around the periphery of society. Our hero, Robert, is definitely not your typical rake. Not even close. He is charming, gentlemanly, intelligent, progressive and... excuse me while I swoon... the very definition of a hero. And Minnie and Robert together. Sparks. Fly. Yes, Robert is one of the few people who can actually appreciate Minnie for whom she really is, but it's not a simple trope. He is written in such a way--has the kind of character--that makes it believable he would *see* her. Because he's the kind of man who chooses to look beyond mere pretense, to the things beneath all the facade. He's the kind of man who seeks the truth in all things. Minnie and Robert have quite a lot of obstacles to navigate to find their way to a happy ending. Very real obstacles. Part of the trick of writing believable historical romance is that you have to get the social norms and expectations--what is acceptable in "good society" and what is not--just right. Sometimes a bit of unraveling at the seams of this concept is necessary to hook contemporary readers. But you can't pull apart the cloth completely or our heros and heroines are left naked in the ballroom--not good ton. Not in any time period. That being said, The Duchess War does, at some points, tug every so gently at the seams of historical accuracy. But these things are not merely waved away, as some novels might do. Any slight improprieties are addressed, given weight, and explained in a way that makes sense. I, as a high-standing member--in fact, I am the Captain--of the Romance Pants Society, would definitely save a spot for The Duchess War on my dance card. In fact, I would save two. Can't wait to see where this delightful story goes in the second half. Look forward to my review!